Sahil qualified from King's College London in 2015 and completed his foundation training in Bedford. He strives to provide high-quality Dentistry to his patients and has developed a keen interest in Endodontics (Root canal treatments) and Fixed Prosthodontics (Crowns & Bridges). 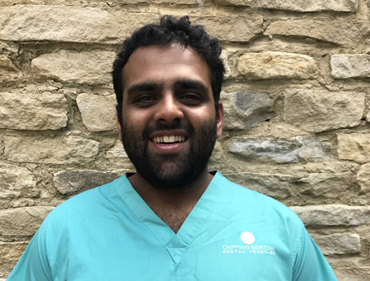 With his friendly and reassuring demeanour, Sahil works with well anxious patients and children to ensure that everyone leaves the surgery smiling. Sahil is currently undertaking the postgraduate MJDF examination at the Royal College of Surgeons of England. In the near future he hopes to undertake further postgraduate training in Sedation and Restorative Dentistry.